Among the convening of the planet’s top business and political leaders in Davos last week, the great leveller was not just the amount of slippery snow all mortals had to contend with on its Alpine streets, but the recognition that countries’ domestic agendas today are composed of different moving parts that no single business initiative or political entity can control effectively. The World Economic Forum’s governing theme, “Creating a shared future in a fractured world,” sought to humble the attendees into recognising the dictates of today’s realities; that the prospects for one nation’s security move in direct correlation to the stability of another, that the anger at the continuing rise of income inequality is not necessarily the same as polarisation through technology, and that migration is not a problem to be resolved, but a human reality that will never change. The word of the week was “data”: the world’s biggest asset and the biggest threat to its stability. Big, commercialised, weaponised, unstructured, non-transparent, and measured in zeta-bytes, data lives side by side with populations whose efforts at digital protection – passwords and not clicking on dodgy links – were long ago relegated to “not doing stupid things” by the digital community. Most business leaders understand little about how data works today. And yet what will truly out-confound all speculation is the emerging biometric kind that will know each individual better than they know themselves. As author Yuval Harari warned, waiting in the tech incubator is the synthesis of AI and biology, which will give rise to biochemical algorithms that will track eye movements, blood pressure and one’s heartbeat, pre-empting what we feel, want and think before we do. Digital dictatorships, anyone? This year’s all women co-chairs of the annual meeting, along with Canadian Premier Justin Trudeau, urged political and business leaders to consider what they are doing for gender equality. 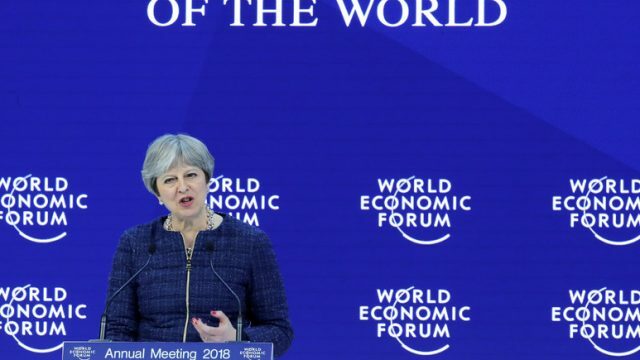 The WEF reported their highest level yet of female participants, but they still made up only 21% of the conference total. China’s move to occupy the vacuum of American isolationism has freed up pockets of political opportunity for others. Selling themselves as islands of stability in an archipelago of conflict, climate change, and digital disruption, Canada’s Trudeau, France’s Macron, Germany’s Merkel, India’s Modi, Italy’s Gentiloni, Israel’s Netanyahu, Argentina’s Macri, Britain’s May, and the Kings of Spain and Jordan, among others, orated to varying degrees of inspiration and audience numbers. Above all, they declared their countries open for business, albeit with their own domestic social contracts, so as to avoid the primal screams of Brexit and Trump. This left Britain’s Theresa May with little option but to give a speech of self-promotion by stealth. Shackled to a no-man’s-land of zero trade deal options for the foreseeable future, hers was a classroom lesson on AI and how British pragmatism and good schools define a good place to invest. Donald Trump arrived on the penultimate day of the conference. His retinue of helicopters, administration officials and secret service agents created an ominous expectancy over the Davos mothership of International World Order. Even the friendly Swiss security personnel turned tetchy, while Davos’s sanguine sophisticates pushed and shoved for a seat at his speech, eyes firmly avoiding each other, lest they reveal their temporary weakness -rubberneckingg at the political car crash of America’s last year. In the end, a quietened American President, disgruntled by the straightjacket of his teleprompter, hinted at a possible return to the Trans Pacific Partnership of trade co-operation, while sounding at times like Brazil’s premier, keen to reform the failures of his predecessors, with their reams of red tape and bad economic governance. The audience greeted in silence the qualification of his original motto, “America First”, with the proviso “is not alone”, and a brief Q and A with WEF founder and Executive Chairman Klaus Schwab was a reminder that demagogues without the opportunity to incite are dull. China’s keynote speaker Liu He, a member of China’s ruling Politburo, was little known but still packed the hall, signalling that the “China dream” of opportunity – including its Belt Road Initiative that will span Eurasia by way of hundreds of billions of dollars in infrastructure – continues to challenge America’s. In light of this, it was hard to give the benefit of the doubt to the assurances of US Transportation Secretary Elaine Chao, on another panel, that it will take China fifty years to catch up to America. Sessions on humanitarian issues tried to prick the moral conscience of the business and political community into moving away from their focus on bottom line profitability. This is at a time when a food package or vaccine is still not delivered to a remote region of a developing country with the effectiveness of a Coke bottle, when the budget of peacekeeping efforts is half that of national military spending, and when social movements demanding fairness and opportunity across the Middle East have morphed instead into the “highest level of human suffering since World War II”, according to UN Secretary General António Guterres. The jury is out whether this year’s World Economic Forum managed to shift the dial on these issues. Because, with everyone pursuing today’s “sweet spot” of economic growth and sustainable investment, it’s perplexing why the world is not an approximate version of Davos; educated, healthy, stable and employed. It also remains to be seen if in the next twelve months the drivers of economic growth can become less Darwinian, and avoid being hijacked by more populism or Marxist utopias of equality that are never equal. With Macron warning about today’s “crise du capitalisme des superstars”, perhaps one of the sub-themes at next year’s meeting in Davos will be on political entrepreneurship.